I’m over at the League of Canadian Poets today, having written about vulnerability on my blog ‘The Writing Parent’. In this blog, I open up about my experience on my book tour…and what happened to me. Thank you to the League for continuing to give me the space to blog about being a parent and a writer! 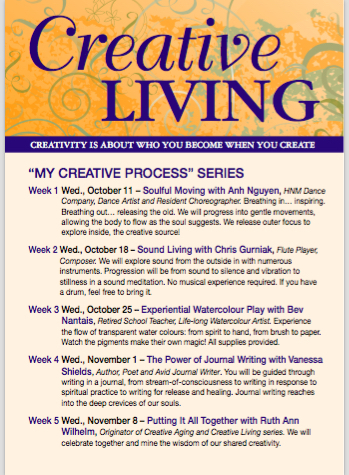 Just a reminder that this Wednesday, November 1, 2017, I will be giving a workshop on the Art of Journal Writing as part of Ruth Ann Wilhelm’s Creative Living series. The workshop costs $25.00 (for 2 hours), and will be held at Atelier Virginianne at 1078 Drouillard. Street parking available. If you’d like to join us, please let Ruth Ann know: 519 – 919-7848. And NaNoWriMo begins on November 1st as well! Check it out! www.nanowrimo.org. Do you have novel you’ve always wanted to write? Well – get to it! Windsor has a NaNoWriMo chapter and will be hosting ‘write-ins’ – just look for more information on the NaNo website. I’ve tasted the Reese’s Peanut Cups – yes, indeedy – they are delicious! And…many of you are asking when you can see my TedX speech. Well, we’re told it can take up to three months for us to get the link to the youtube video. So for now, we wait! I promise I’ll write my ‘what happened’ blog soon. Thank you for all the love and support!